Have you come across these yellow pompom flowers on Pinterest and completely fallen in love with them? If you have, then I’m with you fellow craspedia lover. These are the perfect flowers to add pops of mustard yellow into your wedding flowers, without being too overpowering. 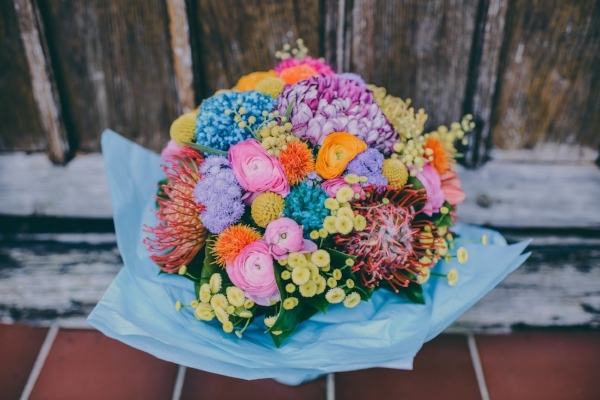 To get the most from craspedia here are 5 handy ways to use them in your wedding flowers. One of my favourite parts of any wedding of course. On this cake, I enhanced the gold and gorgeous bright white icing by using yellow craspedia. They’re a fun way to add flowers to your cake and work perfectly alongside larger, pastel coloured blooms. For all over impact in your wedding venue, it’s a great idea to spread your flowers out. 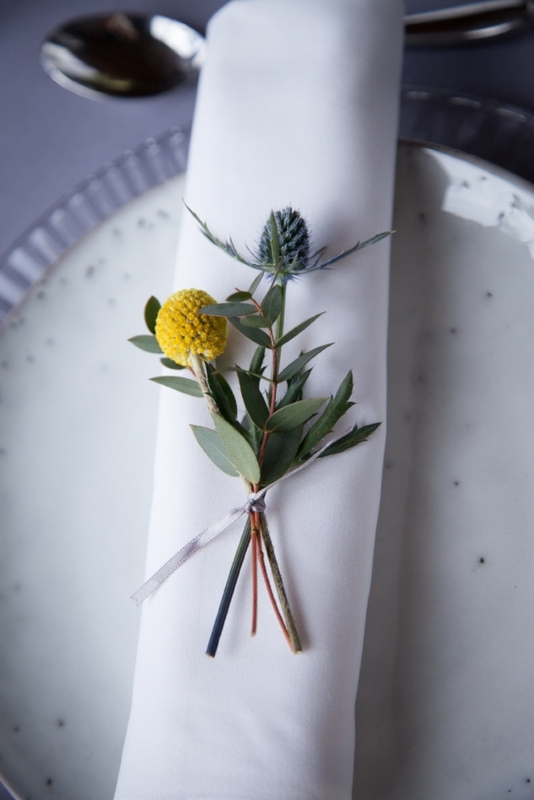 Adding delicate craspedia favours to your guests’ plates gives them something to take home to remind them of the day. Craspedia are great flowers for drying because they retain their bright yellow colour, so this type of wedding favour will have longevity too. You might not be wearing lots of colour on your wedding day so your bridal bouquet is a great way to incorporate your wedding colours into your look. If you’re inspired to have a more whimsical, meadow gathered bouquet, then craspedia are small and delicate enough to add to the wild and natural look. They’re also an amazing flower to use alongside a broad colour palette, as you can see below in this Cinco de Mayo inspired bridal bouquet that also includes handmade pompoms. As your groom and bestman will undoubtedly get hugged a lot from all of the family members, it’s always good to have a robust buttonhole. Craspedia are among the greatest contenders for this role because they’re pretty unsquashable. They’re also a great colour against any teal or navy blue suits and work wonders alongside a mustard or grey tie. If you’re like me and love a well dressed table, then flowers play a huge role in this. These galvanised buckets added a relaxed and rustic look to Bartholomew Barn and the mustard yellow craspedia were a great match for the grey containers. Your table centres can also be given away as thank you presents at the end of your big day, so they’re enjoyed long after your wedding. It’s clear to say that craspedia are small yellow flowers with huge creative scope. They last for ages, they can withstand a bear hug from big Uncle Jeff and they're a very fetching mustard yellow. If you love craspedia, follow me on Instagram for more golden yellow inspiration.